For over 21 years Tyler has been captivating millions of Food Network viewers with numerous hit shows, including: “Tyler’s Ultimate,” “How to Boil Water,” “Food 911,” “Worst Cooks in America,” and the hugely popular shows “Worst Cooks in America” and “Great Food Truck Race.” He has also hosted a variety of Food Network shows and specials, including “Iron Chef,” “Food Court Wars,” “Planet Food,” “All American Festivals” and “My Country, My Kitchen.” He has been a regular guest on the “Good Morning America,” as well as “TODAY,” “The View,” “The Tonight Show,” “Oprah,” “Access Hollywood,” “Extra,” and CNN among many others. 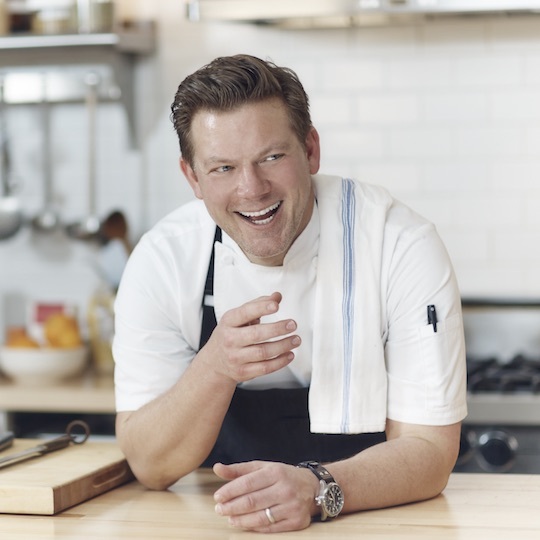 Tyler has built an impressive multi-million business with two restaurants, multiple award-winning olive oil and wine labels, cutlery and cookware, a gourmet food line, and a cooking app, Yumavore, In 2008 Tyler opened Tyler Florence Fresh restaurant, located at San Francisco International airport and in 2010, he opened Wayfare Tavern, in San Francisco’s Financial District. In 2011, Tyler was awarded “Restaurateur of the Year” by Wine Enthusiast Magazine and his restaurants have been consistently awarded three star reviews from San Francisco Chronicle restaurant critic, Michael Bauer. In 2014 and again in 2015, Tyler was honored to be named a James Beard Foundation semi-finalist in their Best Chef (West Coast) category. He also has his own line of award-winning wines sourced from world-class California vineyards. Tyler Florence Wines have received over 29 awards and ratings, including a 92-point rating for his first TF Zin. In late 2017, Tyler expanded his brand to include a film/video production company, Monarch Collective, and subsequently directed/produced a documentary on the 2017 No. California wildfires called Uncrushable, that was accepted by the Napa Film Festival to premiere in 2018. He is currently shooting a weekly video travel series with Twitter called “Wolf It Down” that chronicles his life and travels. His schedule is the script. The show behind the show. %yler and his wife, Tolan Florence, are currently expanding their retails presence to include their private label brand, Florence Family Farms (aka Meadowsweet), curating and creating one-of-a kind consumer products. Tyler has authored multiple best-selling books, satisfying the appetites of hundreds of thousands of fans and readers. Most recently; Family, Friends and Weekends Vol. 1 – Vol, 4 (Chatbooks), Tyler Florence Test Kitchen (Clarkson Potter), Tyler Florence Fresh (Clarkson Potter), Tyler Makes a Birthday Cake, Tyler Makes Spaghetti & Tyler Makes Pancakes (Harper Collins), Start Fresh; Your Child’s Jump Start to Lifelong Healthy Eating and Family Meal (Rodale). In addition to previously released books – Dinner at My Place and Stirring the Pot (Wiley), Tyler’s Ultimate, Eat This Book and Real Kitchen (Clarkson Potter).